The ProWin M4 / M16 CNC Hop Up Chamber is a great upgrade from your AEG's stock plastic, or weak cast metal hop up chamber. 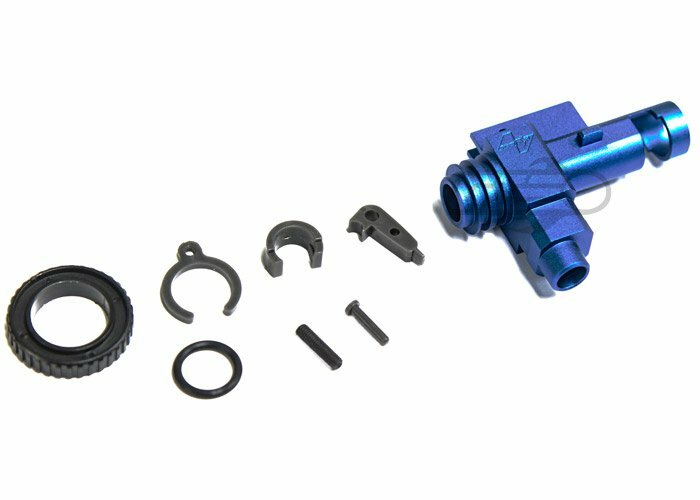 Metal hop up chambers are known for providing a better air seal against the AEG's gearbox, and feeding much more smoothly than plastic chambers. Many cast metal hop up chambers, however, have weak areas in the metal from the casting process, but this problem is completely eliminated with the ProWin chamber. 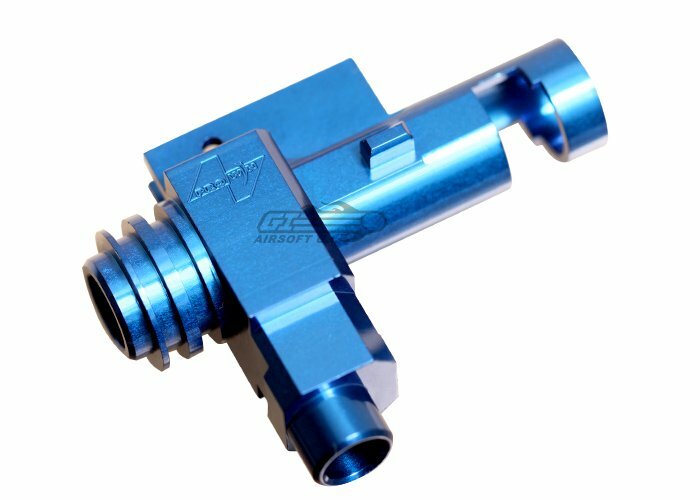 This hop up chamber is machined completely out of aircraft grade aluminum, meaning it is both lightweight and durable, and the bright blue color helps give your AEG a custom look. I use a VFC SR15 and this by far the best I upgrade I have gotten for it. With a Flat Hop you will see an improvement in range and accuracy and a slight bump in FPS. The package I received didn't come with instructions but there are a couple of youtube videos to show how to put it together. I just ordered a Miracle Barrel to go with it so I can't wait to see how that combo works out. Really improved my range and accuracy using the stock VFC barrel while using a Flat Hop nub and Bucking. The adjustment wheel is very stiff and will hold your adjustment. So no having to fiddle with the hop up every time you go out to play. When I ordered it the lack of instructions was a problem. I run these and Modify hop ups in all of my M4s. I absolutely love both of them and have never experienced problems. Love them. Definitely the best rear-wheel M4 hopup on the market. Far better than the MadBull hopup. The Madbull is a joke compared to this. If you're thinking about spending the money for a MadBull, just buy this and save yourself all of the trouble that the Madbull will give you. Will it fit a tavor 21? I have an iwi tavor21 will it fit? If not, recommendations? Will this work in an Echo 1 Troy TRX 10? also, will it help with more reliable feeding vs stock hop up? Will this fit in my G&G Mk18 mod 1 and will it feed well with elite force mids caps? wil this hop up unit work properly in a krytac spr? It will. But we recommend sticking with the Krytac one for best performance. Wi lol this work with m27 iar ? Yes, this component should be compatible. .
Is this compatable with the Miracle Barrel? If not, why? Yes, these items should be compatible. Yes, the CA M15 uses a standard one-piece M4 hop up, and will be compatible with the ProWin Hop Up chamber. will this fit the modify flat hop bucking and nub? I am planning on putting a new barrel setup in my project build and i would like to know if this will fit correctly. Will it fit a agm m4 full metal compact. Will this fit in a VFC Scar-L? If it does what improvements will I see in my gun? Will this fit in my JG Full Metal M4 CQB-R? Thank you for your help. Yes it should work in your airsoft gun. will it fit in the custom airsoftgi g4a3 dmr? Will this fit in a Classic Army ECR-5? This proabbly isn't the spot to ask for tech help but I put this in my VFC 416 and it only feeds if I push mags into the magwell, and I don't know why. A solution would be lifesaver I have an op this weekend. Is this just the chamber or does it include all of the pieces? Will this hop-up unit work with my Echo 1 Platinum M16A4? Will a Prometheus purple bucking work with this, and is this adjustable. It should work with this hop up unit. can the orga inner barrel fit in this? I have a polarstar and was recommended to get this i am wondering if the orga barrel will fit in this or if there is a certain prowin that fits the barrel? any answer is helpful and if there is a certain one please tell me i will pick it up. thanks for the help. Yes the ORGA barrel will fit this hop up unit. I have a SOCOM Gear rifle OEM'd by VFC, will this fit? Will this fit and work in my Echo 1 M4 ST6 PRI? This will not fit because the Echo 1 M4 St6 uses a 2 piece hop up. Would this work on a G&P gearbox? My G&G hop up would not work with it because of the hopup not fitting all the way. does this hop up work with the VFC E-series M4? Is it compatible with the vfc 416? Just picked up the 416 and the hop up units seem similar, however; just want to make sure. This product will have fitment issues with the VFC 416.
sooo from the question above about fitment with the ics m4.. Compatible or not? They will somewhat fit, but our techs have found that modifications are required to get them to feed even decently. This chamber comes with the parts to fully assemble it. This unit will come with the Hop Up Dial, but no c-clamp. I have the newer version of the standard ICS full metal M4, rather than the old PCR-97. Fromthe picture it looks like the hop-up will fit, yet I wanted to make sure before ordering. Pity us ICS owners! As long as the ICS M4 comes with the standard TM style hop up, the Prowin hop up should fit. The Echo 1 Metal line uses a proprietary hop up. The Polymer line should be able to take M4 hop up units. Is this hopup chamber compatiable with the KWA CQR MOD 1? I have a MOD 1 and was unsure whether this hop-up chamber would work in my rifle due to the split hop-up chamber design that KWA uses. This hop up chamber is incompatible with the KWA AEG's. This is because the KWA AEG's use a 2 piece hop up unit design. k120's should feed with this hop up unit. Another factor to consider in regards to feeding is the magwell, which made interfere with the loading of the magazine.